THE best thing about Bhisham Sahni was the that he did his work and then left it at that. He did not want to either talk about it himself or let others gush over it. He believed that in its own way the story that he had told would speak to the readers in its own voice. It did not require him or the critics to be the interlocutors. It was a fine trait to have and it typified his personality, too. But silence and the self- effacement brought with them their own tragedy. Bhisham Sahni could never occupy centrestage of the Hindi literary spectrum and just remained just an important part of the choir. He could never be the soprano though it was his voice that provided muscle to the tone and tenor of writing in his time and age. And, when Bhisham Sahni died on July 11, he did so as quietly as he had lived. Like in his own life, there was no hype on his death. Bhisham lovers took note of his passing away like a personal, heartfelt loss. He did not disturb the others. Bhisham Sahni belonged to the line of writers who identified themselves with their soil. The dust and the heat of everyday life with its emotions and passions, wins and losses were all part of his body of work. He was one with the milieu yet enough removed from it to see clearly and delineate sharply the nuances of a common life. He was, therefore, one of the rarest who could write with restrained compassion about people and their circumstances. He neither dwelt on tragedies too much nor did he celebrate the victories of his characters. He would write about them in a benign detached manner, leaving it to the reader to react to the situation. In his celebrated novel Tamas, a Sikh is forcibly converted to Islam and then ridiculed. Bhisham Sahni wrote about it tellingly but did not overuse it. Punjabi writer Krishna Sobti once told him that he should have placed greater emphasise on it. He did not agree. It was a grim episode and he let it remain that. He felt that it was for the reader to feel shocked or otherwise and not for the writer to propel him in a certain direction. In a way, and like his own life, Bhisham Sahni was a democrat who gave full autonomy to each of his readers to view episodes in his book, as well as the full book, in whichever way they wanted to. Tamas or for that matter Mayyadas ki Maarhi (his own favourite) were both drawn from historical sources, in which there were victors and the vanquished, the oppressors and the oppressed. However, in both cases Bhisham Sahni gave the reader the autonomy to empathise with any viewpoint. No character or situation or historical process was unidimensional, leaving the reader no choice but to see the narrator’s point of view. It is because of this unique quality that critic Roland Barthes distinguished between a "readerly text" and a "writerly text. "Tamas readily falls into the former category. Despite the concern for the reader and various viewpoints, Bhisham Sahni felt "writing cannot be neutral, it is not neutral. I do not accept that the writer is outside the text." But even while writing crisis-centred books and plays, Bhisham Sahni was clear that "it is not for the writer to offer solutions. One can, of course, point to certain possibilities...I am not saying that literature should evade issues. Writing is not an escape from reality. Rather it aims at depicting the complexity of life. It is my belief that life not only offers complexities but solutions, too. Literature captures man’s hopes and dreams and his capacity for problem-solving. His thinking is capable of leading him to a solution, too." In other words, Bhisham Sahni had assigned himself the task of being a compassionate chronicler of people and events. He did not see himself as a visionary or an oracle who could see beyond life situations and be judgmental. He couldn’t be, for he was man with a yielding temperament. He sat back and applauded when his elder brother, Balraj Sahni, took centrestage and crafted a legendary space for himself in the celluloid world. He was with celebrated authors, playwrights and artistes of his time; people from the same stock as him such as K.A. Abbas, Mohan Rakesh, Yash Pal, Krishan Chander, Dharam Veer Bharati, Kamleshwar, etc, who became glamorous names in the literary firmament. But he never resented any of them. It is said by his contemporaries that Bhisham Sahni never gossiped. He didn’t need to because he was never competing with anyone. The samskara of doing your best and leaving it at that was deeply instilled in him. He was happy with himself in his own small world. There were, therefore, no great flourishes in his writing — the flourishes that make a writer and his art flamboyant and toasted. He wrote simply. His creative passion for the story and its characters was like a rumbling volcano topped by the icy lake of his personality. As such, he did not spew forth angrily like a Manto on the theme of Partition nor was he limpidly romantic like a (Phaneshwarnath) Renu. He had seen life red in tooth and claw and had practised active socialism. But whatever he did, he did it with his trademark restraint and maturity. It is no coincidence that he did not create any great heroes in his novels and plays. His characters were one like us who did not have overarching viewpoints. Though most of his plots were crisis-driven, they did not throw up a Ulysses here or a Yudhishthira there. He didn’t feel the need. He was satisfied with his Basanti and Prakasho or an Allaharakha. Even in Mayyadas ki Maarhi, which he could have utilised to create a composite hero, each character has a specific cameo that does not put others in the shade. His more famous plays, Hanush and Almagir, too, do not create larger-than-life heroes. Similarly, though he had the opportunity in both his historical novels, Bhisham Sahni did not create a grand narrative. Tamas and Maarhi are local narratives that do not span out and beyond. Rather, they unpeel like layers of an onion. In fact, the real lure of his writing lies in its compactness; in its smallness at first sight. Bhisham Sahni had read A Hundred Years of Solitude just before he began writing Maarhi, just as he had read Tolstoy, Gorki, Pushkin and Camus during various phases of his writing career. Though he admired all of them greatly, no traces of their influence are apparent in his writing. Like in life, so in his work; Bhisham Sahni was his own man. He drew from various sources but never allowed them to dominate or colour his mind. He was a card-holder who spent many years in the erstwhile Soviet Union. He was an activist in the Progressive Writers’ Movement and he wished to see an egalitarian society. Ideology was important to him and he practised what he preached. Yet, surprisingly, his works are free from polemics and sloganeering that it so typical of activist-writers. What comes across very hauntingly is his concern for the poor and the underprivileged and the humaneness of his character. Indeed, he lived with the emotion of compassion rather than the ideology of socialism. It is because of this defining quality that Bhisham Sahni would be remembered as a first -rate gentleman and a remarkable writer rather than an ideologue and an activist. 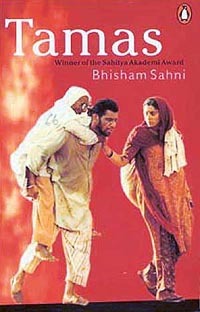 AS Krishna Sobti put it very aptly, Bhisham Sahni deserves the epithet of Bhisham pitamah of Hindi literature. Bhisham Sahni’s friendship was a boon for me, something I will always treasure. For more than three decades I knew him not only as a significant writer but also as a wonderful human being, someone who never allowed the greatness of his writing to affect personal interaction. In 1966 we met with each other for the first time when he was the editor of Nayi Kahanian, the journal brought out by Rajkamal Prakashan. We were brought together by destiny on four significant occasions of our lives. In 1973, the Languages Department honoured us together. He was honoured for writing in Hindi, while I got the first Nanak Singh Puruskar. In 1975, Bhisham Sahni got the Sahitya Akademi Award for Tamas and I for Addh Chanani Raat. In 1992, we were nominated to the General Council of the Sahitya Akademi together. In 1998, for the fourth time we went together to the Rashtrapati Bhavan, he received the Padma Vibhushan and I the Padamshri. Perhaps it was our shared concerns and similar worldview that brought us together on these momentous occasions of our lives. When it comes to heart-felt emotions and sensibilities nothing except the mother tongue can help one to articulate those. Whenever we met, not only did we always converse in Punjabi but we also wrote letters to each other in Punjabi in the Devnagari script during the last three decades. Despite the fact we wrote in two separate languages, we shared so much with each other, there was a bond of intimacy. So self-effasive was Bhisham Sahni that in a friendship that spanned 35 years, not even once did he speak about his own work or even ask if I had read any of his recent works. He would be enthused about whatever others wrote and shunned self-focus. More than literature, we talked either about Punjab or about Balraj Sahni, his elder brother who I knew before I did Bhisham. Particularly etched in my memory is the meeting when I went to Delhi to condole Balraj’s death. We had talked about him, shared memories and felt overwhelmed. As an eminent critic Plekhinov put it, the purpose of literature is to help us share our joys and sorrows, not only with the characters but also with other human beings in life. Reading literature hones our sensibility and generates empathy within us, it enables us to extend that empathy to those we interact with in the course of our life. That was the kind of literature Bhisham Sahni wrote and believed in. There was no contradiction between life and literature, no split between the man who suffered and the mind that created. It was this particular quality of identifying with the people and the concepts of shared traditions and value systems—something that still endures in the Indian context—that marked Bhisham Sahni’s work. It is precisely this kind of literature that is, unfortunately, not being written nowadays, because literature has become a commodity and literary pursuits more than a matter of conviction have become a business enterprise. Writers are getting lost in the business of writing almost in the way a child gets lost in a mela. A writer in his mould saved values that are worth saving even in today’s world. Not a single literary work of his could be termed as just written for the sake of writing. They all stemmed from deep convictions and a rootedness in the socio-cultural milieu quintessentially Indian. Unlike Bhisham Sahni, no one now focuses on real issues and problems that are inextricably linked with and related to our milieu and moorings. It has become fashionable to talk of deep psychological problems and the argument given is poverty is not our reality, so there is the consequent search for one’s reality. What is this reality? The search begins and for people like this it is like being trapped in a maze, trying to figure out what the reality is. The media, especially the English media too does not want to focus on issues that concern the masses but do not interest the classes. That explains why there is not much focus on writers and much less on a meaningful and purposeful writer like Bhisham Sahni who was a torchbearer of a humane value system. There might be greater writers but the yug of great men like him seems to be over. 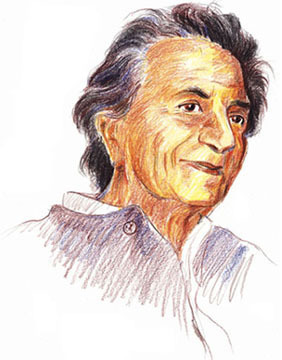 BHISHAM SAHNI was the most important and eminent writer in the tradition of Premchand. Social realism and the end goal of an independent, anti-imperialist order had fired the latter’s imagination, as it did Bhisham Sahni after Premchand’s death in 1936. Not only were his concerns similar to those of Premchand but he also shared the former’s vision of a socialist, secular India as opposed to the one dominated by a capitalist worldview and trader’s mentality (mahajani sabhyata). Consistently this integrated vision and worldview of a composite culture found expression in his novels, plays and short stories. It is this very notion of a pluralistic, composite culture that is now being threatened. Significantly, the women’s question and a voice of resistance and protest was raised in a significant manner, perhaps for the first time, by Bhisham Sahni in the play Madhavi which was based on episodes from the Mahabharata. As a dispossessed writer, vivid images of Rawalpindi haunted him. It was not only nostalgia but a deep sense of loss and the anguish of a lost homeland that pervades his work. A defining feature of literature in the 20th century was the way being in exile as a compulsion, not as a conscious choice like the diaspora, writers were influenced by the sense of being dispossessed. This was true of writers from India, Pakistan or even Europe. His realism was akin to Premchand’s but with a sense of detail that is enormous. He describes not simply as a narrator but shows rather than merely telling. The authentic lively characterisation and drama invested a film-like quality to his works. In this new kind of realism, there was history and a mixture of fantasy and reality. 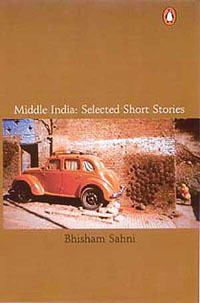 In terms of technique, unlike Premchand, Bhisham Sahni’s was not simply a linear narrative but he used the flashback technique adroitly, wherein the narrative went back and forth in time and space. What shaped his writings and work were the exposure and impact of three languages and cultures. During the formative years, it was the Arya Samaj influence that led to him imbibing Sanskrit. As a student and teacher of English literature, there was exposure to world classics and the best in the West. Though Bhisham Sahni wrote in Hindi and was placed in the Hindi literary tradition, his defining sensibility, milieu and moorings were that of a thoroughbred Punjabi. So words and influences from all these languages contributed to his oeuvre. The language of his novels was not bookish or formally stilted but instead had the effortless ease, cadence and naturalness of the spoken word. Ours is essentially a peace-loving country with a history of great thinkers and philosophers and poets. The culture of our land is dictated by common folks. You see when I read Camus or Sartre, I like them. But if I try to write like them, I cannot. Their culture, history and belief system I cannot inherit. If we force ourselves to write like them, the results would be merely imitative. If people knew each other, they would find it hard to hate. It is my belief that life offers not only complexities, but solutions too. Literature captures man’s hopes and dreams and his capacity for problem solving.